Feature: Setting Sensible Targets For Your KPIs. Q&A: Does every performance measure need a target? 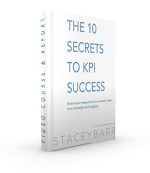 Quick Tip: How to best display a target on your KPI graph.